Across America and even throughout the world, smaller fire departments have often used residential firefighters, also known as "sleepers", to supplement their staffing. Typically it has occurred in small communities that can't afford full-time positions or as many as they needed, and desired some dependable coverage. While the programs still happens today, the number of programs like this has declined significantly due to many changes in society, including population growth, labor laws, agreements with labor groups, and other issues. The number of programs in Marin County peaked in the 1970's and 80's, and is down to only a few today. These programs were also found at many college campuses where they had their own fire departments. Several still exist today in America. For example, U.C. Davis still has a residential firefighter program for students, supplementing paid staff. Larkspur native Ken Dubuc went through that program while gaining his degree, before going on to serve in the U.S. Navy in shipboard firefighting. When he came out of the Navy, he worked at Skywalker Ranch for several years, and today is the Fire Chief in Port Angeles, Washington. Many of these firefighters went on to successful careers in the fire service or in other professions. For example, Bill Wright from Corte Madera FD went on to found and own Golden State Fire Apparatus, the very successful Pierce Fire Apparatus dealer based in Sacramento. Bill is the President and CEO of Golden State today.. 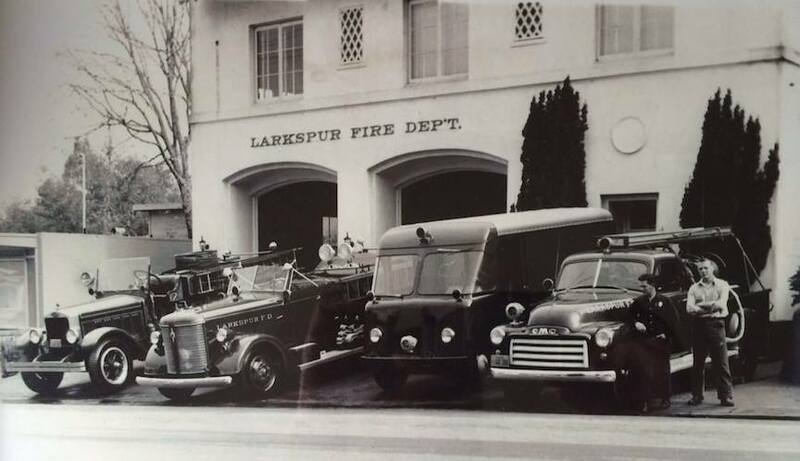 The feature below is a closer look at one local fire department, Larkspur FD, through the eyes of one-time sleeper Bill Lellis, who started in the 1950's and would many years later retire as the Fire Chief. Thanks to Bill for this story. In the 1950’s, most of the Marin County fire departments were primarily volunteer, often with a paid Fire Chief and perhaps a few paid firefighters. Throughout the County, these departments often included staffing with “sleepers”, or non-paid residential firefighters living at the stations in exchange for free rent. Over the years, many of these men would go on to become leaders in the county fire service and beyond. We know of “sleeper” programs in Kentfield, Corte Madera, Tiburon, Ross, Marinwood, and beyond. We hope to learn more about all of them, if we can find someone from those departments willing to share their history. My own story I'll begin in January of 1958. I was a student at the College of Marin, majoring in history, hoping someday to be a teacher. I was going to school on the G.I. Bill, having recently been honorably discharged from the U.S. Air Force. I was living in a one-room flat on Bank Street in San Anselmo, on $110 a month. A good friend of mine from school told me of a sleeper program at the Larkspur Volunteer Fire Department, and that I should meet with Fire Chief John Raggio to ask about the program. I stopped by the station to meet with Chief Raggio. He told me all the beds were currently taken, but that in a few months sleeper Art Wedemeyer was going to be married, and that his room would become available. Art was a second generation Larkspur Volunteer Firefighter. His dad owned the local sweet shop, and is one of the Larkspur firemen featured in a cover story on LFD in Colliers magazine in 1948. Until Art left, the chief offered me a bed in the old FD family kitchen which was not being used, since the Fire Chief’s family did not live at the station anymore. This offer was good if I didn’t mind sleeping on an old army cot. I jumped at the invitation, and would have slept in the oven if I had to. My $110.00 from the G.I. Bill would now last until the end of the month. So on February 1, 1958, I became a member of the Larkspur Volunteers, and the course of my own history for the next 50 years was about to change. The only requirements at that time were that you had to work one weekend a month, and if you were in the station, you responded to all calls. The Fire Station Lay Out: The building had been built in 1937, with funds raised from the outdoor Rose Bowl dance that the LVFD operated for many decades. The second floor of the two-story building was designed to accommodate two living quarters. The front of the building was the living quarters for the Chief and his family, with two bedrooms, a living room, and a large kitchen. Chief Mel Geister and his family were the last family to occupy this living area. Mel’s father was at one time was also the chief of the department. The quarters in the rear of the station was designed to accommodate the volunteer sleepers and the 24-hour paid staff. It consisted of the day room, the pool table room, now the T.V. room for the paid staff, and a small kitchen, which is now the Historical Room. Downstairs, there was space for four apparatus. You entered the small FD office through the front door or from the engine bays. Behind the office was the fire alarm system, and the battery room that powered the alarm system. At the back of the engine room was a small tool room, with two 'holding' cells, aka jail cells, for those visitors to the Rose Bowl dance who misbehaved, usually under the influence of alcohol. This meant they had a room for the night, and the bars left on the two windows today are the only reminder of those heydays. 1958 Staff and Sleeper Working Schedule: Fire Chief John Raggio, born in San Francisco, was a member of a U.S. Army Air Force B-17 bomber squadron who 'delivered the mail' to downtown Germany during World War II. After the war, the chief worked at the Marin City and Hamilton Air Force Base fire departments, before taking the Chief’s job in Larkspur. Chief Milus G. Baugham had resigned, and the job was given to Assistant Chief John Raggio in April, 1949. He had been with the department after the war had ended in 1945, originally as a volunteer fireman. Being a bachelor, John lived at the station, in what is today the Fire Chief’s office. Being a fireman back then did not pay much, nor were the benefits much. Most paid men would supplement their income with side jobs and sometimes businesses. In John’s case, he was the owner of one of the early Marin ambulance companies, Marin Ambulance, stationed at the foot of Ward Street in Larkspur. In those days, if you could wear a white coat you could be an ambulance attendant. The roles and training for EMT and Paramedic were not invented yet. In addition to responding to accidents and medical calls for 'scoop and run's' to the hospitals, John also had the County contract to transport people to and from a 72-hour stay at the Napa Mental Hospital, which became my primary job. In those days a family member or a police officer could go to the Sheriff’s office and take out papers to have someone committed to the Napa State Hospital for 72 hours of observation. They would then be transported back to the County Court House for a hearing, to determine if they could be released, or would have to return to Napa for further observation. Running down Rice Lane to the ambulance in the middle of the night was a regular job for me, with John close on my heels. I made two dollars a call on the ambulance! This business ownership would be Johns' down fall as the Chief. He would take calls while on duty, which was a “no-no” according to City Manager Harry Piper’s standards. His firing of Chief Raggio made the headlines in the San Francisco Chronicle, and generated a lot of controversy in the community. The headlines read “City With No Fire Department”. Assistant Chief George Bartram and Firefighter Clair Harder completed the three man staff with John. George and Clair were boyhood friends from the Sioux City area of Iowa. They had both served in the Pacific at the end of WW II, dis-assembling bombs on Saipan. They resigned a few days before Chief Raggio was let go. John would later return to the department as a volunteer for many years, and became one of its outstanding members and leaders for the next few decades until his death. He went on to become the owner of a very successful trucking business called Minute Man Delivery, hiring many Larkspur sleepers, off-duty paid men, and volunteers to drive for him. He operated out of the building next to the old railroad bridge on East San Francisco Blvd. in San Rafael, and later in Greenbrae near where Trader Joes is located today on the east side of Highway 101. After Chief Raggio left the job, George came back and was promoted to Chief, and Clair to Assistant Chief. Chief Bartram was responsible for my hiring into a full-time position. He would some years later leave the FD to become an executive for All State Insurance. Again, the FD jobs did not pay much back then. Clair would leave to start his own Moving and Storage business. Firefighter Willy Wilson, who drove the city street sweeper for Public Works, was hired to complete the three-man department, with 30-35 volunteers on the roster. The Sleepers as of 1958: The sleepers at this time included Art Wedemeyer. Art was a decorated Korean War veteran. He had been seriously wounded during the Battle of Chosin Reservoir, and recovered in part at the hospital at Mare Island. He later served as a firefighter at the Naval Net Depot in Tiburon, and on Treasure Island as part of the Navy’s Fire Department. Art would later become a member of the Larkspur FD paid staff, before leaving to work in the fire protection equipment service. Art’s premature death was from complication of his wounds received at the Battle of Chosin Reservoir, still considered one of the toughest engagements ever fought by the U.S. Army and Marines. Read all about his story, with photos and video of the battle included, here on the Marin Fire History site. Ranger Benz, a local kid whose dad Walter Benz was also a longtime volunteer, would go on to become a full-time Senior Captain for LFD, and retired in that position. His son Roger would join the volunteers in the 1980’s, and eventually became a paid Captain in the Corte Madera FD, the third generation in his family to serve in the Twin Cities. Clive Coverdale was a free spirited person would worked for the Tiburon and Larkspur Fire Departments before going to work for Boeing in Seattle. The Work Schedule: Chief Raggio worked a typical Monday thru Friday 40-hour week. He had a pick-up truck with a small pump and about 100 gallons of water, in which he could pump and roll. George and Clair would work 24-hour shifts, and half a day on Saturdays. All three were on call 24-7. In 1958 the only way to let the volunteers know there was an emergency in the city was to “pull the hook”, which would activate the air horn on the top of city hall. This was started by putting brass wheel number 7 on the Gamewell Alarm System board and pulling the hook down. The horn would blow seven straight, in a series of four times. The department had no radios of any kind. If you failed to mark the blackboard with the street address of the call, it would be a very lonely firefight, for you only had three minutes of water on the first truck, and on most calls you responded alone. The sleepers were in charge from Saturday noon until Monday at 7am, when George or Clair would come on duty. Looking back on those days, one realizes that 18 and 19 year-old kids with very little training and fire ground knowledge were in charge of the city's fire defenses. Today they wouldn’t let you near a fire engine unless you had 300 hours of basic training and a minimum of Firefighter I certification, but that's how we got it done. Any time you were in the station and we broke a call, you were required to respond. The first out unit was a 1951 GMC squad, which only had room for three firemen. This truck would be donated to the Nicasio VFD in 1972. The next rig out was a 1948 American La France 500 GPM Class 2 engine. A Class 2 engine could pump at 120 psi, as compared with today’s engines that pump at 150 psi. Behind this engine was a 1928 American La France, 1000gpm positive displacement pump. The South Placer Fire Department currently owns it, and it is fully restored. Saturday mornings were typically training days for all sleepers. We would have contests, such as who could don a 15-minute breathing apparatus the fastest, starting from sitting behind the wheel of the 1951 GMC. If I recall the best time was 12 seconds. The self-contained breathing apparatus were stored in suitcases on the side of the squad. We were not allowed to turn on the breathing apparatus, because if you did they had to be transported to San Anselmo Fire Department for filling - they were the only department who had a breathing air compressor. The volunteers also had two drills a month on Tuesday evenings, and the sleepers were required to attend. I am not bragging, but the sleepers were a very proficient group of young firefighters. A funny thing happened on the way to the San Quentin prison, located on the eastern side of our city. Our uniforms in those days were black 'Big Ben' brand pants and light blue shirts, which, by the way, was the same attire that the inmates at San Quentin wore. We would respond occasionally to fires both on the prison grounds and in the open space where “Boot Hill Cemetery” is located. Getting back to town could be a problem, if you had to prove you were not an inmate. 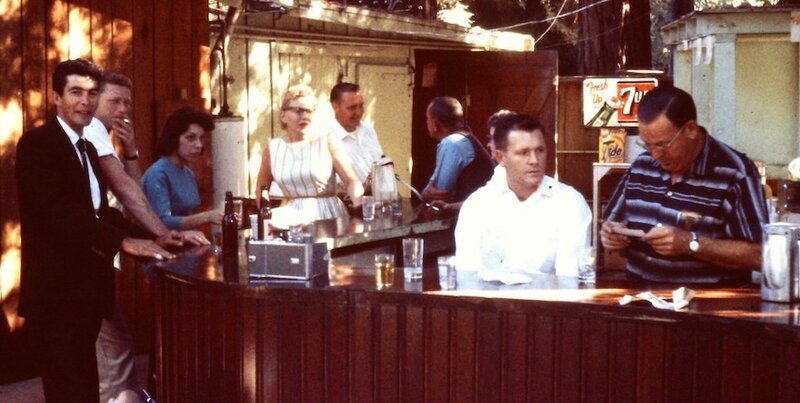 The City In 1958: The City of Larkspur was a much smaller place with only 5,000 population. The area from Doherty Drive to Bon Air Road was all tidal marshland, with three boardwalk communities. They had been there since the turn of the 20th century, and were mostly summer homes. Boardwalk One is still a historic area of the city. Boardwalks Two and Three filled the space between Bon Air Road and Doherty Drive along the Corte Madera creek. Boardwalk Four ran from Bon Air Road to the College of Marin. A fire on the boardwalk was a nightmare - all the suppression equipment had to be hand carried out to the fire along the wooden planks. A fire on Boardwalk one was my last working fire as chief before I retired.This land is now a mix of bike and hiking paths, apartment buildings, convalescent homes, and doctors’ offices. Bon Air Road and the bridge did not exist, and were just a set of plans on some engineers drafting table. If we had a call in Greenbrae or Bon Air Apartments we had to respond past the Kentfield Fire Station, since we had no radios. The only way to inform them was by landline on the phone. The area today includes Henry C. Hall School, the Phil Green Police Station, Piper Park and Bundy Field, was at that time the city dump. The volunteers would have their share of fires at this dumpsite, when fires would burn for days. Harry Piper, for whom the park is named, who was the first City Manager. He was a World War II bomber pilot and, like John Raggio, 'delivered the mail' to downtown Germany. Bob Bundy was the Assistant City Manager, and a former pro basketball player, who drew up the master plan for the park and named the softball field after himself as a joke. At one moment in time, the council named the park instead in honor of Astronaut John Glenn, but later changed their minds. Magnolia Avenue had a big hump as it passed the Escalle winery into the intersection with Bon Air, so today coming down Bon Air one can still see the profile of the old road. The Northwestern Pacific Railroad still ran to Doherty’s Lumber Yard on what had become a rail spur line. When it passed Larkspur Corte Madera School on it’s way to and from Corte Madera and Mill Valley, the school children would run to the fence, and the engineer would blow his whistle and wave to the kids, who were jumping and waving in return. It was a simpler time in our history. Offices for the City staff were on the ground floor of City Hall, which is part of the Larkspur Library today. ​The police department had their offices on the other side of the lobby, where Chief Howard Clark, also a volunteer fireman, ran a very tight ship. Volunteer fireman and businessman Oakley Dexter was also a member of the police reserves. We were never sure if Howard allowed him to have his one issued bullet actually loaded in his sidearm. The upstairs of City Hall was pretty much a vacant room, where the community would sponsor plays once or twice a year. The stage hung out the back of City Hall, which since has been removed for safety. Public Works Department was where the parking spaces are today behind city hall. Working for Public Works was my first job after becoming a sleeper. Warren Mistron was our leader of Public Works, and all members of the department were required to be volunteers. Warren was the volunteer Assistant Fire Chief. In September of 1960, I had returned to school, when Chief Bartram offered me a job as a full-time fireman. I turned him down, but in a few weeks my life would change very quickly. I had met a beautiful strawberry blond named Janice. She took all my money and kept it in a safe place, known as the Bank of America, where she was a teller. While the chief was holding interviews for the paid position, I informed him that I would like the job since we had decided to get married. We've now been married for 57 years. $110.00 dollars a month would not go far, even in 1960. The chief informed me since I didn’t take part in the testing and interview process, he felt it would not be fair to the other candidates. A few days later he offered me the job.... it’s called ‘pulling my chain.’ We rented a very small gray house behind the fire station for $75.00 a month. 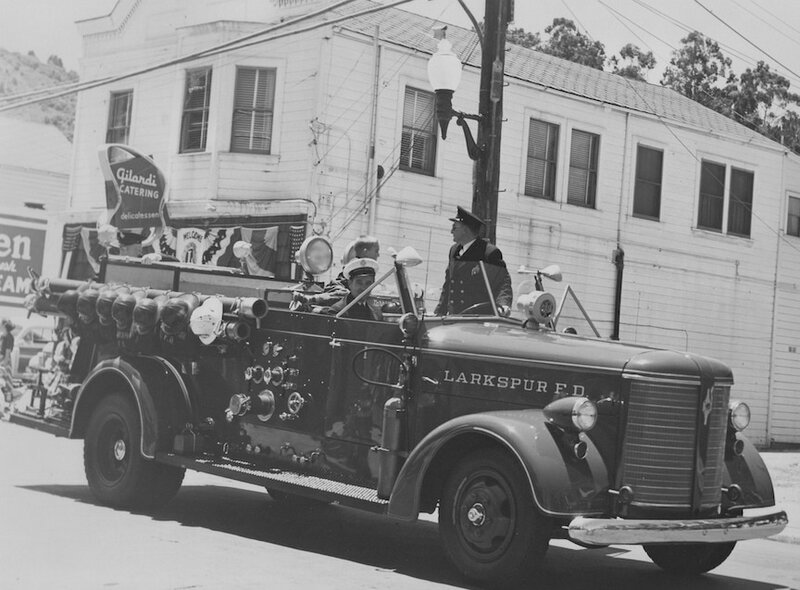 In 1960 all fireman were required to live in the City of Larkspur. So on September 16, 1960, for $285.00 a month I began my 72 hours a week job. The next 30 years were great, and I would not change a thing, it was a wonderful career. Some Great Sleepers: Between the two stations, Larkspur hosted over 100 sleepers, many of whom went on to distinguish themselves, and some examples follow. Craig Shurtz was a young man from Mill Valley in the late 1950’s. He worked for the Larkspur Public Works Department and was a sleeper before getting hired in the FD. He became the Fire Chief after Chief George Bartram resigned, and Craig later retired. His son Scott Shurtz is now the interim Fire Chief for both Larkspur and Corte Madera, as they explore possible merger options. One stormy day the doorbell at Station 2 rang, and standing in the rain outside I found a veteran named Pat Williams. All he wanted was to come out of the cold, so I invited him in. He had just returned from Vietnam, and was still wearing his fatigues. He seemed like a good kid, so I offered him a sleeper position at the station. Pat went on to a long career with the San Anselmo Fire Department, and is now retired. He also served as a council member of the Town of Corte Madera. Sonny Wilson was from Albany, and went on to graduate from U.C. Berkeley and became an architect. Jim Alban went on to a distinguished career with the Sunnyvale Public Safety Department. Ted Berrum went on to be Assistant Fire Chief in Carson City, Nevada. Tom Forster was a refugee from Corte Madera, where the 65-year old Corte Madera Volunteer FD Ltd. had just dissolved after a conflict with the Town Council over their autonomy. His grandfather Frank Nelson had retired after serving as police and fire chief and in several other roles for the town for 41 years. Tom’s father Jack Forster was a longtime volunteer with the VFD, now dissolved. Tom decided to join Larkspur FD in 1976, given the bitter conflict in his hometown FD. After serving three years as a sleeper at Station 2 while earning two A.S. Degrees at College of Marin, Tom became our summer vacation relief fireman, while he was attending Chico State University. I offered him a full-time position, but because he wanted to complete his bachelor’s degree he turned me down. He went on after college graduation at Chico to serve George Lucas as his Ranch Manager and Fire Chief at Skywalker Ranch for the bulk of his career. Tom still works part-time for Skywalker Properties Ltd., going on 34 years, and is the volunteer Fire Chief for Plumas Eureka in Plumas County where he now lives. Jim Buscher, a local Larkspur boy, started as a volunteer, before going on to work for Lucasfilm Ltd. and Tom at Skywalker Ranch. Jim went on to a career as a paid firefighter in Larkspur. His wife Darlene was from Kentucky, and Jim eventually got hired with the Louisville, Kentucky Fire Department, and is now retired and one of the principles in a fire investigation firm. I first met Jim when he was only two years old. He had locked himself in his bathroom. His Mom Barbara called us for help. We could not get him to unlock the door, so through the bathroom window I went to rescue little Jimmy Buscher. Bob Sinnott came to us at 16 years old as a cadet, after growing up in Hillview Gardens in Larkspur, and while attending Redwood High School. He would later progress from a sleeper, to getting hired full-time, accepting the position that Tom turned down. He promoted to Fire Marshal, and then to Fire Chief, and is now retired, although he then accepted a position at San Rafael FD as Deputy Chief, where he still works… who knew? Matt Gustafson was from Greenbrae, and also went on to work for Tom at Skywalker Ranch before becoming the Fire Marshal and Battalion Chief for the Windsor Fire District in Sonoma County, where he still serves today. These are just a few of the successful men who served the citizens of Larkspur as sleepers, and I thank each and every one them. It was my privilege to have my roots in this system. ​Photos from the Larkspur FD historical collection, Bill Lellis, the Wedemeyer family collection, and Tom Forster. Chief John Raggio accepting the donation of an oxygen resuscitator unit from the Larkspur Lions Club. Art "Bud" Wedemeyer Jr. in the U.S. Marines. He would later fight in the Battle of Chosin Reservoir in Korea, recognized today as one of the most difficult fights in Marine Corps history. Chief Mel Geister stands in the drivers seat of the 1947 American La France pumper, while parked along Magnolia Ave. in a Larkspur parade. 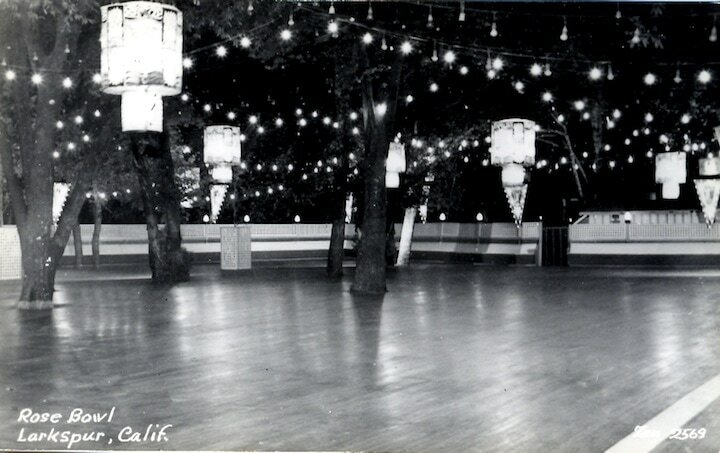 The outdoor wooden Rose Bowl dance floor was set among the trees, and was operated by the Larkspur Volunteer FD for over 50 years to fund operations. 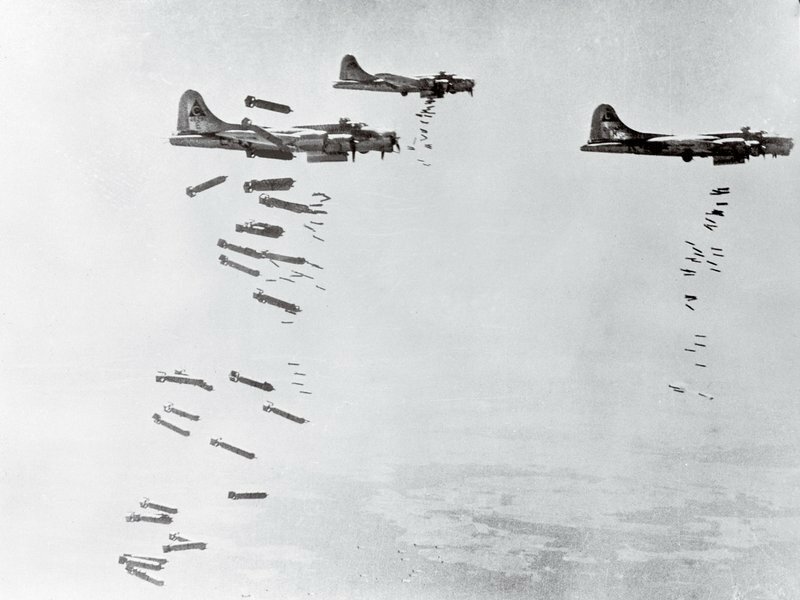 U.S. B-17 Bombers "delivering the mail" to Germany in World War II. Larkspur's John Raggio served on a Army Air Corps B-17 in the war. 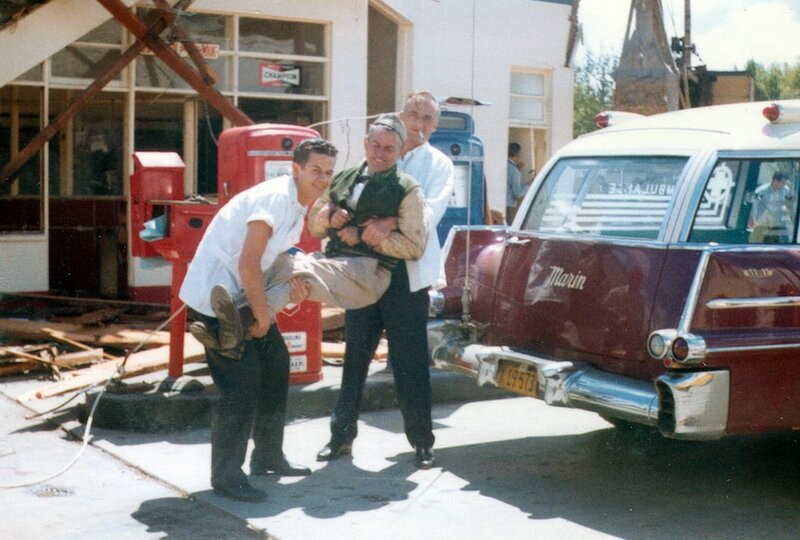 A crew from Marin Ambulance kidding around with owner Cliff Archer at his Chevron station in Larkspur. The newly rebuilt and expanded Napa State Mental Hospital in 1954. 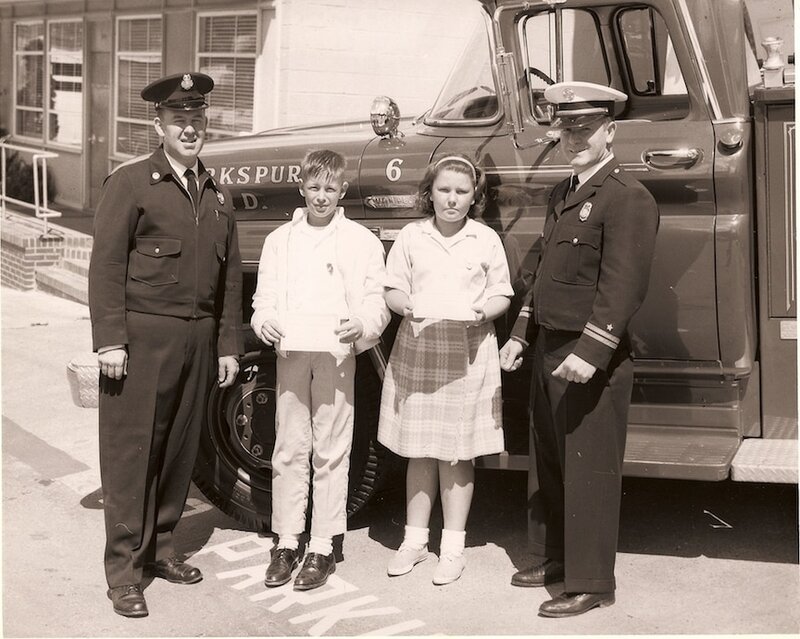 Larkspur FD in the late 1950's, with George Bartram and Clair Harder by the 1951 GMC. A young Art Wedemeyer, working at Treasure Island FD operated by the U.S. Navy for many years. A young Ranger Benz hanging Christmas lights at the Larkspur Fire House. Ranger would retire as a Larkspur captain many years later, and his son Roger Benz is retiring in 2017 as a Corte Madera Captain. (l-r) Larkspur Firefighter Art Wedemeyer, a young Robert Fox, young girl tbd, and Chief George Bartram in a fire prevention contest award ceremony. Bob Fox would later become a Larkspur Fireman, and many years later retired as the Corte Madera Fire Chief. A residential fire in Heather Gardens in the early 1960's, with the American La France pumper on the left and a GMC Van Pelt Squad in the middle. 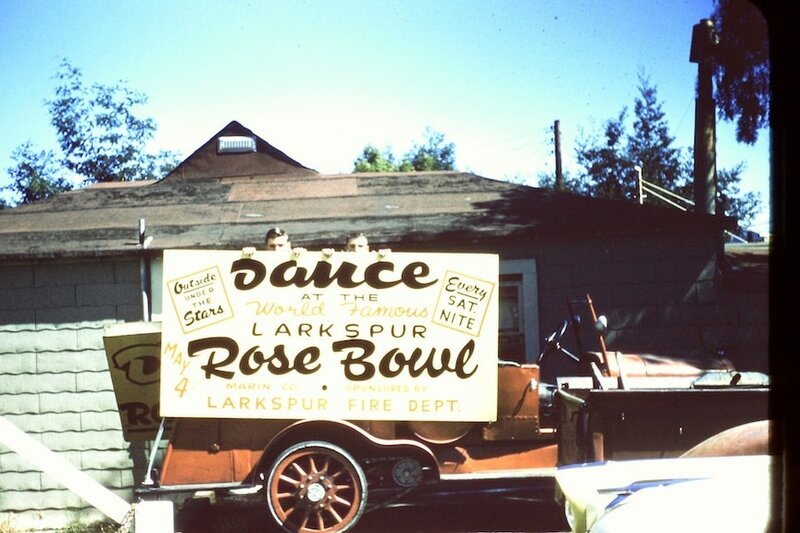 Hiding behind a Rose Bowl Dance sign are Larkspur Firemen Ron Nelson and Ranger Benz. A well involved home fire on one of the Larkspur Boardwalks. Posing for a Rose Bowl Dance publicity photo next to the 1927 American La France, the couple on the right are young Carol and Craig Shurtz. 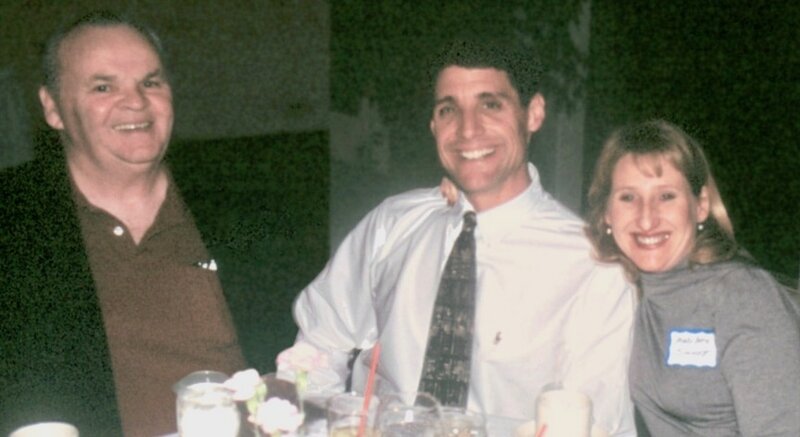 They are the parents of today's interim Larkspur and Corte Madera Fire Chief Scott Shurtz, and Craig is a retired Larkspur Fire Chief, still living in Larkspur. Larkspur Chief Dolph Doherty seated in the drivers position of the 1922 Stutz pumper proudly owned by the Larkspur Volunteer Fire Department, purchased with funds from the Rose Bowl Dances. All volunteers and some sleepers on a training night (l-r) Ted Berrum, became Assistant Fire Chief in Carson City, Jim Alban had a long career in Sunnyvale Public Safety, Roy Territo of Larkspur Public Works, Sonny Wilson became an architect after graduating from UC Berkeley, and possibly Jim Niven kneeling. The 1951 GMC Squad, shortly before it was donated to the Nicasio Volunteer FD in 1972. It had a 100 gpm piston pump and a 200 gallon tank. Group photo at the Rose Bowl, (l-r) Sleeper George Oliver, also City building inspector; Rod Biddleman, Kentfield and Larkspur Vol FF & Public Works employee; Fran Oliver, George's wife; Willie Wilsons' daughter in-law, name unknown; Asst. Chief Clair Harder; Willie Wilson; Rose Denton; Chief George Bartram; Don Denton, long time volunteer. A young Bill Lellis on the left, and Craig Shurtz, after they were hired full-time and had promoted to Captain positions. A young Jim Buscher, handing out fire hats to kids at a Larkspur Open House, about the time he was a sleeper. (l-r) Bill Lellis, Bob and Mary Sinnott at a Marin County Fire Chiefs Installation Dinner at Deer Park Villa. A newspaper ad for firemen in 1953 in San Anselmo.